Our mission is to represent visually and chronologically the priceless heritage of Lac qui Parle County, Minnesota, which includes Lac qui Parle State Park, and the towns of Bellingham, Boyd, Dawson, Louisburg, Madison, Marietta and Nassau. Lac qui Parle (locals pronounce it Lak kwa Par-uhl ) is a French translation of the native Dakota name, meaning “lake which speaks” and is a reference to a lake formed by the widening of the Minnesota River along the northeastern border of the county. We encourage all veterans and their families to come to the Grand Opening as our special guests. 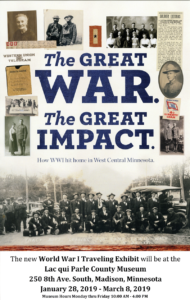 This traveling exhibit, created by the West Central Minnesota Historical Association (WCMHA), is focused solely on west central Minnesota and includes stories of those who served from Lac qui Parle County. Additional stories and artifacts from the museum’s collection will be displayed to tell the story of Lac qui Parle County’s involvement in the war. The exhibit will be open to the public January 28 thru March 8, 2019, Monday through Friday, 10:00 am to 4:00 pm. and by appointment (320-598-7678). The exhibit is made possible by a Minnesota Historical and Cultural Heritage Grant from the Minnesota Historical Society. Credit Card or Paypal Balance: Use the Paypal button if you would like to use a credit card; safe, secure and you do not need a Paypal account. If you do have a Paypal account you have the option of paying from your existing balance. Cash or check: Stop in at the museum, or email us a request for a membership form.